Are you looking for the best thermal compound for your CPU or GPU? Perhaps you’re not sure what thermal paste to use? If that’s why you’re here, you’re in for a treat because we’ve personally tested over 20 of the most popular pastes used by both enthusiasts and builders to come up with our top 6 best thermal pastes. Computer components heat up when in use. With the processor and the graphics card, this is so bad that they usually have their own dedicated cooling setups. And on those setups, you need thermal paste to help the heat transfer and diffuse; otherwise, you’ll be rebuilding parts of your rig. But there are a lot of pastes on the market and not much to differentiate between them, at least on the surface. This only gets more confusing when you take into account the different types of thermal pastes: ceramic-based, carbon-based, metal-based, and liquid metal thermal paste. 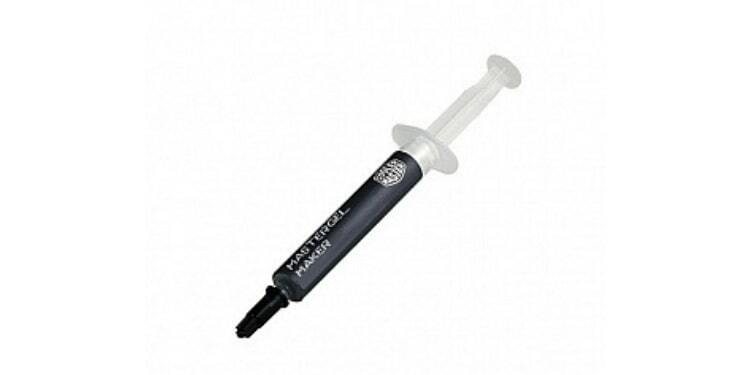 So without further ado, here are our top 6 best thermal paste reviews. Do you need a thermal grease or a liquid metal paste? Noctua is a trusted name in the cooling industry. This isn’t the best on the market but considering its performance for the price and easy application, this is still a solid pick. Whether you’re a beginner looking for a thermal paste you can rely on or an advanced builder, you know the Noctua NT-H1 has what it takes to give you decent cooling performance. With a thermal conductivity rating of 8.5 W/mK, this ceramic-based thermal compound can keep your temperatures down for 5 years after application. It’s also worth noting that this has a 3-year shelf life. If there’s one thing you should keep in mind here, it’s the fact that Noctua has some quality problems with some of their Noctua NT-H1 products-- though chances are slim. 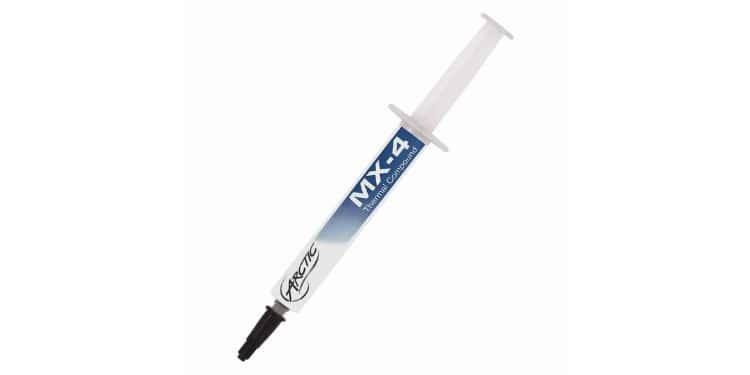 This carbon-based Arctic MX-4 thermal paste is one of the least-expensive pastes on the market. 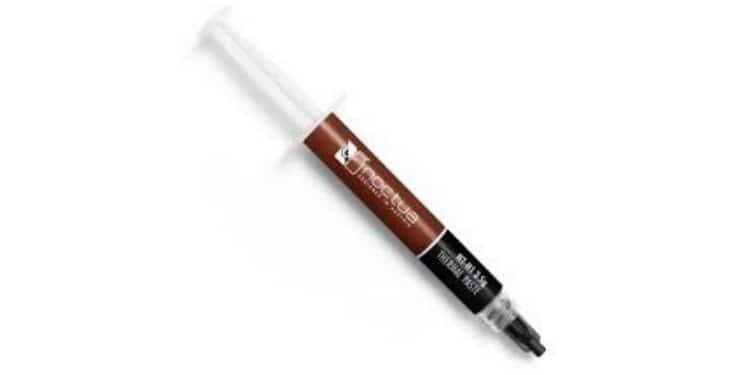 It’s also considered as more of a mid-range thermal paste and is not ideal for novices because of its viscous property. But as long as you do the application right, there shouldn’t be too much of a problem-- even if you’re a beginner. And that’s what makes this thermal past one of the best CPU thermal pastes out there. With a thermal conductivity of 8.5 W/mK and an 8-year lifespan once installed, you can almost entirely forget about it and move on with your gaming life. In fact, there’s a good chance you will need to replace your CPU before you will need to replace this. 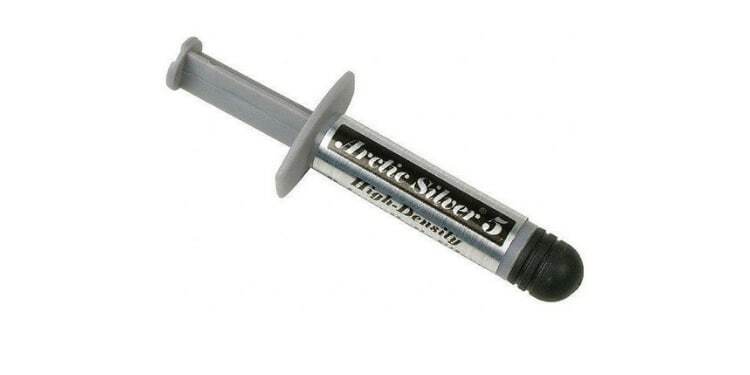 The Arctic Silver 5 is a ceramic thermal paste that’s been proven and tested since it was made available to the public. In fact, it’s what I personally use. The thermal paste is ideal for most setups although it’s primarily optimized for modern high-power CPUs and high-performance heatsinks (it’s even good for water coolers). If we were to compare the Arctic Silver 5 and the Arctic MX-4, this would easily be considered the cooler option. Thanks to the 99.9% silver particles, the effectiveness of the thermal paste can be relied upon-- with a thermal conductivity recorded at 8.9 W/mK. Just remember that this has a sticky nature so the application can be a challenge. With a thermal conductivity rating of 11 W/mK, the Cooler Master MasterGel Maker Nano is a good thermal paste as far as thermal grease cooling capability is concerned. This means it’s a highly recommended paste if you’re looking to overclock your air-cooled CPU. In fact, this can perform just as good as a few of the premium-grade thermal pastes on the market. Cooler Master is also considerate enough to include a spreader and a pack of alcohol swabs, so you're all set when changing your CPU thermals. Just take note that this paste has a burn-in time so you might not get the advertised cooling temperatures upon installation. 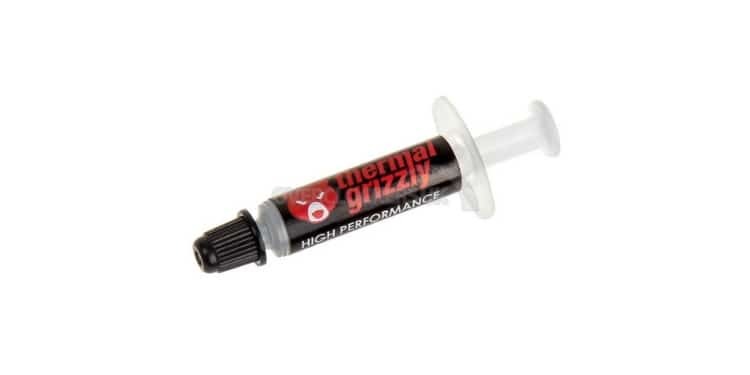 The Thermal Grizzly Conductonaut is the paste for serious overclockers. With a thermal conductivity rate of 73 W/mK, it’s easily the best on the market. Yes, that’s a seven and then a three. This is technically several times better than the rest of the competition. If you’re wondering this does have a very tangible effect. While it might not keep your CPU 7 times cooler, it does lower the temperature by as much as 10 degrees Celsius more than the rest of the pastes on the list. If that doesn’t make it the best GPU thermal paste, then I don’t know what would. 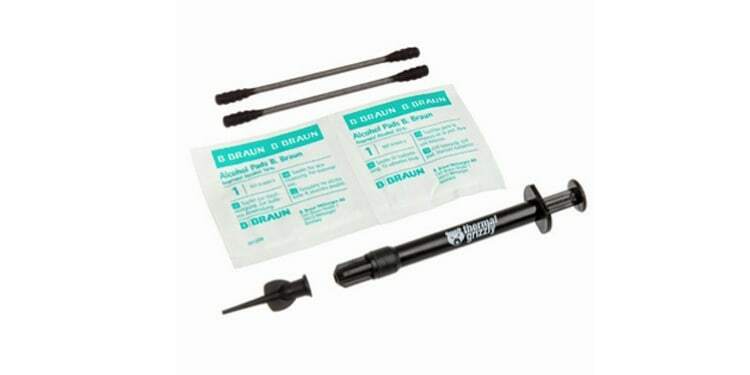 This metal-based thermal paste comes with all the tools needed for installation. It’s also worth noting that you need to thoroughly clean the CPU before you apply the paste to ensure the best performance along the way. And that you must not use it on aluminum heatsinks because this liquid metal thermal cooler can leave black stains on it. While it is the most expensive paste on the list, it’s not insanely so, especially considering the extra performance gains it can help you get when overclocking. If you want a slightly more affordable option compared to the Conductonaut above, the Thermal Grizzly Kryonaut is a solid option. It may not have a really high thermal conductivity rate like the above but it still delivers a completely respectable 12.5 W/mK, which is still the second highest on the list. It’s also the reason why this is so popular for overclockers and extreme gamers. Honestly, this paste falls into an odd middle ground. If you want elite performance, then the Conductonaut is the best option. And if you are not looking for elite performance, you might want to save a few bucks on a cheaper but still effective paste. That’s where its one strength over the Conductonaut comes into play: it can be used with aluminum. It’s important to choose the right thermal paste when shopping around. Unfortunately, a lot of people overlook this task and blindly buy whatever they can get their hands on. Needless to say, choosing to buy the right thermal paste matter a lot– especially if you’re going to overclock your CPU or GPU. But since there are so many brands and types you can choose from, it’s going to be hard for the average user to make the right selection. So, to answer your “where to buy thermal paste?” question or just give you a hint what to consider when buying one, here are among the most important factors that will help you pick the right one for you. When applying thermal paste on your CPU or GPU chip, it’s highly recommended that you check online resources ahead of time as each paste may differ. Most do come with instructions though. There are some consistent aspects though. For instance, you never want to apply too much; it’s always best to put too little and need to add more than too much and have to clean a mess off your motherboard. Usually, a pea-size dot in the middle of the chip is the way to go as you don’t need much to spread evenly across the chip as you fit the CPU cooler in place. It’s also important that you check the amount of thermal paste before making a purchase. Images of thermal pastes online always look big, but in reality, most of them are really small. In fact, even if they do look big in person, they usually only contain enough for one or two applications. That being said, as long as you are buying from a trusted brand, it should be enough for at least a one-time use. So, unless you’re going to use it for more than one unit, it shouldn’t be a pressing issue. Pro Tip: If you check the products on Amazon, it should clearly indicate the quantity of each one. Each product has its own shelf life and lifespan after application. In most cases, these have a shelf life of up to 2 years at most. The lifespan after application is often quite longer though– regularly as long as 5 years after it’s been applied to your CPU or GPU. Needless to say, it’s best you check these ahead if you’re planning to store the remaining paste and use it years later. Price is usually commensurate with the amount and efficacy; although, brands can sometimes charge a premium for their name, as with any product really. That being said, it’s usually still reasonable, unlike Apple products. Needless to say, thermal pastes higher conductivity rates– ie the more expensive ones– are ideal only for users who are serious about overclocking. If you don’t plan on overclocking, possibly because you have a locked CPU, a thermal paste with a lower conductivity rate should be fine. What Is The Best UPS (Uninterruptible Power Supply) In 2019?